Riomaggiore is the most southern village of the Cinque Terre. It is quite sure that the origins of Riomaggiore date back to the 8th Century, when the inhabitants of the Vara valley, searching a milder climate to raise grapevines and olive-trees without the fear of pirate raids, moved towards the coast. The town climbs up along the ridges overlooking the sea and it is characterized from the typical stone houses with coloured façades and slate-roofs. In Riomaggiore starts the Via dell’Amore (Lover’s Lane), a wonderful path known for the romantic atmosphere and amazing landscapes. It leads to Manarola and it takes twenty minutes walking. Please refer the footpath situation section. The Cinque Terre are linked by a network of paths that offer the best opportunity to truly enjoy the unique landscape. All five villages are well connected by rail, regular local trains from Genoa and La Spezia run with high frequency. 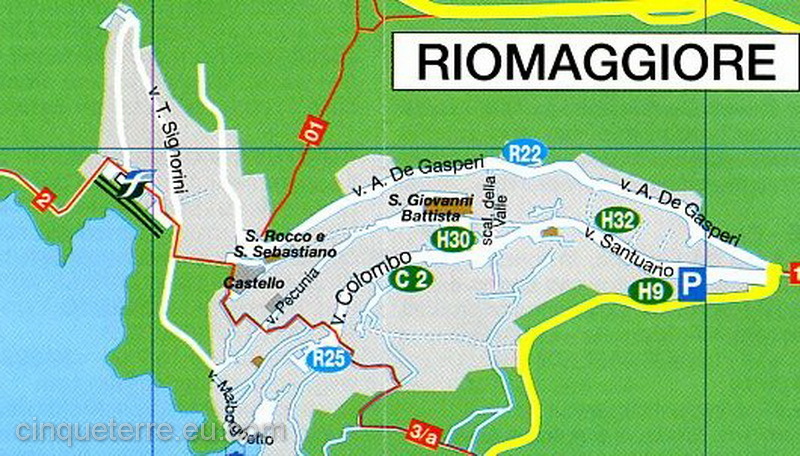 • Via dell'Amore, Riomaggiore is connected to Manarola by this famous path. • The Church of San Lorenzo (1338) with its beautiful rose window dating back to the 14th century. • Castle of Riomaggiore (built in 1260): where you can enjoy a wonderful sight over the sea. • About 350 metres from the sea, along the coast road connecting the Cinque Terre with La Spezia, you can find the Sanctuary of Madonna di Montenero; enjoy the breathtaking panoramic view of the whole coastal line of the Cinque Terre.